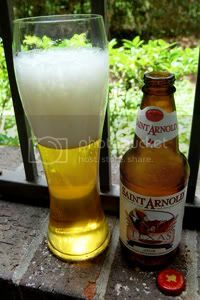 First brewed back in the 1994, Saint Arnold Texas Wheat was only the brewery's second official offering. Developed in front of a local homebrew shop, it was initially known as "Kristall Weizen"—a reference to the beer's style. Kristalweizen is a German style of wheat beer that is essentially a filtered version of Hefeweizen. While most American wheat beers contain less than 30 percent wheat, Texas Wheat is built with half malted wheat and half 2-row barley. Perle hops are employed for bittering, while Liberty hops are used for flavoring. The beer now uses the same Kölsch yeast as the company's Fancy Lawnmower, but used the brewery's proprietary ale strain for its first ten years. A refreshing, flavorful filtered wheat beer [and] the perfect beer to accompany a meal or for a summer's day. The wheat contributes a lighter flavor while maintaining a rich body. The beer has a light hop profile -- just enough to give the beer balance and complexity. It may not be the perfect time of year for this beer, but let's just close our eyes and pretend its 100 degrees outside. Appearance: A slightly hazy pale straw body with a huge white head that features brilliant retention and spotty lacing. Taste: Sharp lemon and apple over a tasty and grainy wheat backbone. Towards the end, there's enough of a bitter hop dimension to add more complexity. Clean. The aftertaste is grainy with the barest hint of alcohol. Mouthfeel: Medium-light bodied and velvety with smooth carbonation. Dries in the finish. Drinkability: Excellent, as you'd expect from any wheat beer worth a damn. Verdict: Saint Arnold has created a solid Wheat beer, perfect for a Summer's day here in Texas. While it may not the most complex beer in the world, it does its job well.